The painter, whose work is aptly described as "ghostly," depicts the exclusive social formations of children. 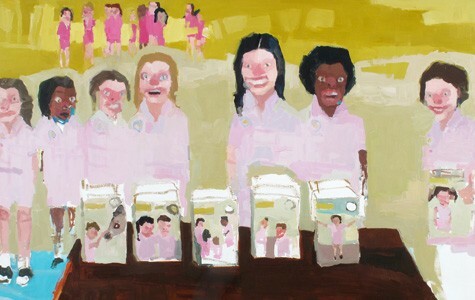 Jennie Ottinger's "Are You Buying What We're Selling." Past critics have described Jennie Ottinger's paintings as "ghostly." The artist tentatively accepts the observation, venturing that it may have to do with the way her works present shifting frames and distorted space. Her amalgamations of small, colorful brushstrokes variably deepen and flatten the suburban-looking environs depicted. "It is definitely more a formal exploration than a symbolic one," she said, "although it does contribute to the vague notion that something is amiss, even if it is difficult to pinpoint." Well, the past critics were right. Ottinger's pieces are ghostly; indeed, this is overwhelmingly the most striking trait of the works in Members Only, now on display at Johansson Projects. Specifically, her paintings are creepy in the manner of Georges Seurat's later pointillist works, like "A Sunday Afternoon on the Island of La Grande Jatte." While ostensibly a pleasant, if eerily quiet, picture, Seurat's masterwork takes on a disturbing dimension the moment you really look into one of the subjects' faces — and realize you are staring into a staticky void. Ottinger's painting style is more smeary and less controlled than the post-Impressionist's, but the effect is similar: The faces of her subjects, which in the present series tend to be pre-adolescent girls (also a horror trope, for what it's worth), quiver between blankness and grotesque distortion. Eyes sit wide and misaligned. A pink stroke will slash across the lower jaw as either a joker's grin, demonic grimace, or gaping threat. Say hello to the most disturbing church congregation and Girl Scout cookie sellers you've ever seen. Accompanying the paintings is a more theatrically ghostly procession of white frocks, suspended from transparent threads to give the impression of a levitating cohort. While the garments are more or less uniform, Ottinger allots them select distinguishing attributes in the form of odd fabric tails or sewn-on heads belonging to what look like abject teddy bears. 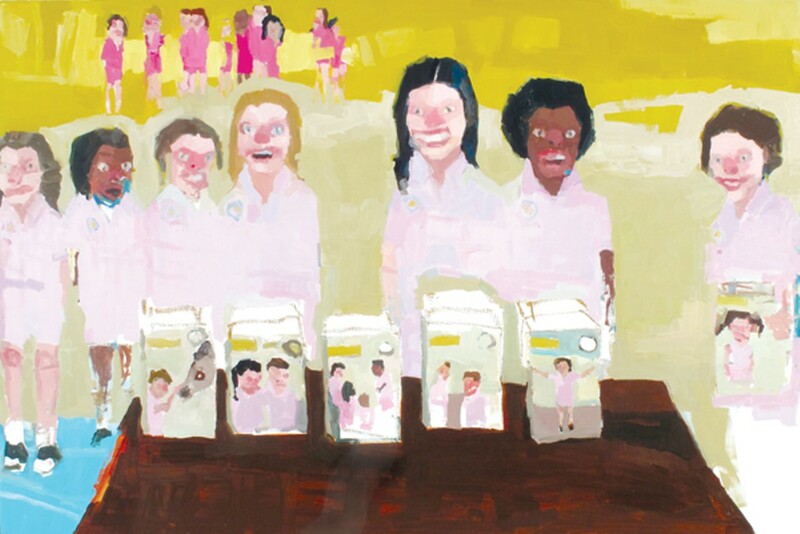 Ottinger's professed theme is social grouping and exclusion, a lifelong behavior that happens to manifest itself most acutely on the schoolyard. She "explores the little laws that separate the chosen ones from the masses," as seen in "the precarious moment when a child's adorable uniform, from the right angle, looks almost like a cult member's regalia," or "the haunting gaze that begs you to join and the icy glare that assures you are not welcome," according to the show's press release. But these subjects don't look at you — only in your general direction. This is what renders the paintings so ghostly — not a characteristic of the subjects, but of the displaced viewer. The vagueness of the subjects' faces severs the possibility of a connective gaze, leaving the viewer with the spooky sensation of sharing perhaps a space but not a reality. It is a phenomenon that occurs in supernatural and social hauntings alike.